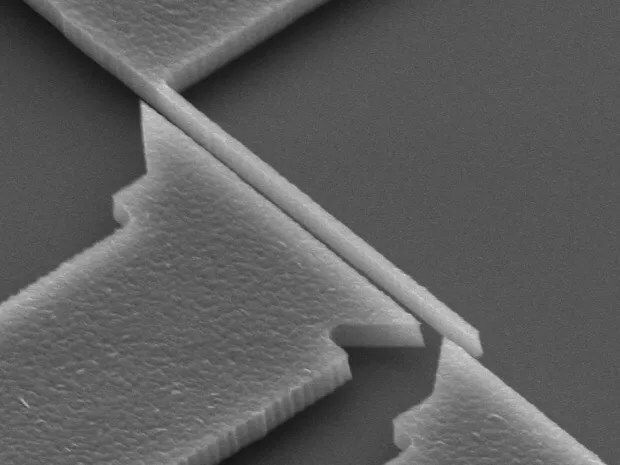 Photo: Philip Feng/Case Western Reserve University Radical Relay: A silicon carbide nanomechanical switch can switch for days without breaking. The end of Moore’s Law feels closer than ever. Chip-industry leaders are going to strange lengths—fin-shaped transistors and exotic semiconductors—to keep delivering better integrated circuits every year, and some alternatives are starting to look attractive. A number of research teams are working on substituting the transistor switches that form an IC’s logic and memory circuits with nanoscale electromechanical switches, or NEMS. One obstacle to real-world implementation has been that these devices wear out quickly and then break, but new findings presented at the International Electron Devices Meeting in Washington, D.C., yesterday show that these switches can actually function for days or weeks in air, putting them closer to a commercially viable life span. Engineers at Case Western Reserve University, in Cleveland, created silicon carbide mechanical switches that could open and close tens of millions of times during multiple days of testing. Previous research conducted at Case Western and in other labs focused on achieving power and temperature goals and involved only switches that functioned properly for a handful of cycles. What’s more, the nanoswitches in these trials performed comparably in ambient air (about 25 °C) and in high-temperature conditions (500 °C). One advantage to nanomechanical switches is that they don’t consume power when they’re in their off state, as common MOSFETs do. (Although the complementary logic scheme used in processors today, called CMOS, ideally should not consume power except when switching, current does leak through the transistors in practice, wasting power.) But by using nanomechanical switches, logic gates can draw less power and be more efficient. “It switches very abruptly. When it’s on, it’s on. When it’s off, it’s totally off,” Feng says. The engineers used their switches in integrated logic gates to show their potential for digital computing at a broad range of voltages.